Choose from 69 hotels and guest houses in Lothians. Shown below a just a selection of the hotels available. To search within an area please use the menu on the right. Situated on the Royal Mile, close to the castle, minutes from the main shopping areas of Princes Street, this hotel offers an extensive Health & Leisure Club. With 189 spacious bedrooms, the Barcel? Edinburgh Carlton Hotel provides quality accommodation, with a luxury continental-made Bette Bath in every en suite bathroom. Excellent food is available from the Bridge Restaurant and Bar on the first floor. Car parking is available locally, and Edinburgh Waverley station is only 2 minutes away. Edinburgh International Airport is placed just 7 miles (11 km) away. Ask Angus the concierge, or any of his colleagues, to give you some personal recommendations on places to visit! For accommodation with a difference, these spacious, designer, 2-bedroom serviced apartments boast a city centre location, luxury interiors and daily maid service. With fully-equipped kitchens and spacious lounges, the self-catering apartments are suited to business or leisure visits to Edinburgh. Fantastically located just off Edinburgh's historic Royal Mile, this aparthotel offers the perfect place from which to 'walk Edinburgh'. Space, style, comfort and convenience sum up the Holyrood Aparthotel. Modern, clean lines, dark cherry wood flooring and Italian tiled bathrooms are just a sample of what the sophisticated apartments offer. With a superb Edinburgh city-centre location, this modern Premier Inn hotel offers spacious en suite rooms and discounted parking, just a few hundred metres from Edinburgh Castle. The Premier Inn Edinburgh City Centre (Lauriston Place) is a short walk from Princes Street Gardens, the Grassmarket and the Royal Mile. Rooms offer satellite TV. Some rooms can take 2 adults and up to 2 children (under 16 years). The 2 children also get a free full breakfast when accompanied by an adult eating a full breakfast. The full all-you-can-eat breakfast has the expected cooked items, including vegetarian sausages, as well as a wide continental selection. The hotel offers guests discounted parking at the Riego Street public car park, a 2-minute walk from the hotel. The beautiful Victorian mansion Norton House Hotel & Spa was originally built in 1840 and is today a fully refurbished yet traditional country retreat. It is located only 5 km (approximately 3 miles) from Edinburgh International Airport and 14.5 km (approximately 9 miles) from the bustling Edinburgh city centre with all its sights and attractions. 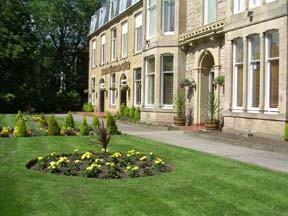 The Health Club at Norton House Hotel & Spa offers an extensive range of treatments. It provides the latest fitness equipment, as well as a group exercise studio, swimming pool, hydrotherapy pool, steam room and sauna. Use of the spa facilities is free for residents of the hotel, excluding treatments. Expect great facilities and services, lovely and peaceful surroundings, and excellent food at the Norton House Hotel & Spa. 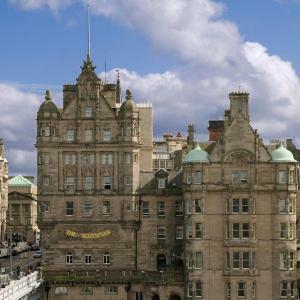 Radisson SAS has a perfect location on the historic Royal Mile, in the heart of Edinburgh city centre. Edinburgh Castle, Princes Street and Waverley Station are within 500 metres. All rooms are modern, comfortable and relaxing, with free Wi-Fi internet and a work desk. Radisson SAS Hotel Edinburgh has parking on a first-come first-served basis (spaces can not be pre-booked), at an additional cost. All residential guests have free access to Evolve Leisure Club with swimming pool and gym. You can book wellness treatments such as massages and facials for an additional charge. A 15-minute drive from Edinburgh Airport, beside the M8 and the Deer Park Golf & Country Club, this Premier Inn hotel has family-friendly rooms, free parking and an on-site Beefeater restaurant. Some rooms can take 2 adults and up to 2 children (under 16 years). The 2 children also get a free full breakfast when accompanied by an adult eating a full breakfast. The full all-you-can-eat breakfast has the expected cooked items, including vegetarian sausages, as well as a wide continental selection. This comfortable, family-run hotel enjoys a pleasant atmosphere and surroundings, situated only 3.5 kilometres (2.2 miles) from Edinburgh city centre. The Northumberland Hotel is a traditional, individually-styled hotel which acts as an ideal base for city breaks, keen golfers, shopping and tourist attractions. The centre of Edinburgh just a 5 minute taxi ride away. The team at the 16-bedroom Northumberland Hotel, through their personal service, aim to ensure that guests have a comfortable and relaxing stay. This modern, boutique hotel is in the Southside area of Edinburgh. It is a 15-minte walk from Edinburgh Castle, Princes Street and Waverley Station. Good lighting, mirrors, chrome, steel and polished wood create a stylish decor. Borough Hotel has free wireless internet. A wide staircase leads upstairs to the bedrooms. Rooms have 'warehouse windows', chandeliers, and modern showers with a Turkish-bath-style feature. Based at Pollock Halls at Holyrood Park, this varied B&B campus accommodation is close to the city centre and parliament buildings. Edinburgh First accommodation lies in the shadow of Arthur's Seat and is near to the Royal Mile and the Palace of Holyrood House. Breakfast is served between 07:30 and 10:00 in the self-service restaurant at John McIntyre Conference Centre in the centre of the campus, about 5 minutes' walk from each bedroom. Refurbished in November 2005, this family run hotel offers a prime location and value for money in the heart of the city. Located just off Princes Street, the city's shopping hub, you are a short stroll from Edinburgh's main attractions. The National Gallery of Scotland is just around the corner, which houses paintings and sculpture from Renaissance to Post-Impressionism periods. The gallery features art by Botticelli, Goya and Rembrandt to name but a few. Visit the castle, and make up your own mind about the controversial Holyrood parliament building. The grade A listed Georgian Ballantrae Hotel offers more traditional delights, with high ceilings and spacious rooms featuring period details. Here, you will find elegant accommodation full of character, where a balance is struck between history and modern comforts. The hotel offers 24 hour reception cover for your comfort and security. Please be aware that we have free parking but spaces are limited subject to availability on a first come first served basis. A 20-minute drive from Edinburgh, within reach of 3 rail stations, this Premier Inn hotel has free parking and is only 2.5 miles (4 km) from Musselburgh Racecourse. The Premier Inn Edinburgh (Inveresk) is less than 10 minutes' drive from Newcraighall, Musselburgh and Wallyford rail stations. There are comfortable en suite rooms and a family-friendly Brewers Fayre restaurant serving pub-style meals. Some rooms can take 2 adults and up to 2 children (under 16 years). The 2 children also get a free full breakfast when accompanied by an adult eating a full breakfast. The full all-you-can-eat breakfast has the expected cooked items, including vegetarian sausages, as well as a wide continental selection. Just off the Royal Mile and moments from Edinburgh Castle, this boutique hotel boasts luxurious rooms and superb views across Princes Street Gardens to the Firth of Forth Fraser Suites Edinburgh is located on St Giles Street, the former 'Fleet Street' of Scotland. Dating back to the 1800s, the historic building features bespoke art commissioned from the Edinburgh College of Art. Friendly, polite staff will make you feel welcome. Enjoy contemporary style and a kitchenette, whether you opt for a room, a suite, or an apartment with stunning views over the city. Close to Deer Park Golf & Country Club and Livingston Stadium, with good access to shopping centres and the bus station, the hotel offers free parking and rooms with luxury power showers. 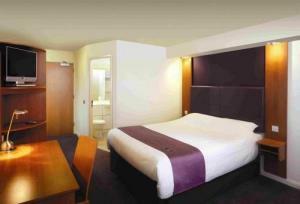 Some rooms at the Premier Inn Livingston (Bathgate) can take up to 2 adults and 2 children (under 16 years). The 2 children also get a free full breakfast, when accompanied by an adult eating a full breakfast. The full all-you-can-eat breakfast includes cooked items, vegetarian options and a wide continental selection. Premier Inn Livingston (Bathgate) is next to a Toby Carvery restaurant, serving traditional cuisine in a welcoming environment. Offering a fantastic city centre location, within walking distance of many theatres, museums, shops and major attractions, the hotel is easily accessible from the city's main train station. Jurys Inn Edinburgh is ideally located in the heart of Edinburgh, with the International Conference Centre, Edinburgh Castle and a host of other tourist attractions within short walking distance - not to mention great shopping, theatres, art, museums and galleries. The hotel located on Jeffrey Street, in the heart of Edinburgh's old town, just off the Royal Mile and only a few minutes walk from Edinburgh Waverley railway station, the city's main station. The ideal central location and excellent public transport links makes Jurys Inn Edinburgh your perfect city centre hotel, whatever your reason for visiting this dramatic city. This 5-star boutique hotel sits beside North Bridge, overlooking Edinburgh Castle and Waverley Station, a minute's walk from the Royal Mile and Princes Street. A grand baronial property with modern styling, it is one Edinburgh's greatest buildings, formerly home to The Scotsman newspaper. Edgy design puts sheet glass and steel girders alongside the original walnut panelling, stained-glass windows and marble staircase. Each unique room has an Edinburgh Monopoly board. 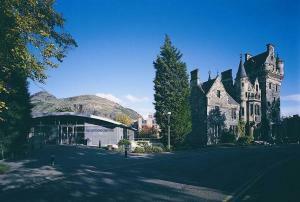 The Scotsman Spa and Health Club is the urban flagship for Thalgo in Scotland. The soothing spa has a pool, gym and many Thalgo treatments. The Scotsman Hotel was voted by Conde Nast Traveller as one of the top hotels in the world, and winner of AA Hotel of the Year for Scotland. Discounted parking is available at the NCP in Market Street, 5-10 minutes' walk away. This modern, stylish and inviting hotel is in Edinburgh's West End, close to the heart of the city, with excellent transport links. Edinburgh International Conference Centre (EICC) is just 0.5 miles (800 metres) away, and Edinburgh Castle is one mile (1.5 km) away. The excellent shops lining Princes Street and George Street are just 0.5 miles (800 metres) away. Hilton Edinburgh Grosvenor features contemporary comforts and facilities, including interactive LCD flat-screen TVs and high-speed internet access. Set within 1,000 acres of beautiful parkland in Kirknewton, this elegant hotel offers the ideal base for a peaceful countryside break, just 7 miles away from the centre of Edinburgh. Boasting the only golf resort in the local Edinburgh area, the Marriott Dalmahoy Hotel & Country Club offers two 18-hole golf courses (one Championship course) and a PGA approved golf academy. If golf isn't your activity of choice, the hotel also features a gym, indoor swimming pool, spa and tennis facilities. In the evenings you can enjoy a freshly prepared meal in the Dalmahoy's award-winning restaurant, Pentland, whilst admiring the beautiful views over the surroundings. To complete your evening, retire to one of the newly refurbished guestrooms, fully equipped with all that you need for a relaxing and memorable stay. In Edinburgh city centre, less than 500 metres from Haymarket Rail Station, this modern hotel offers great value, with modern family-friendly en suite rooms and a restaurant-bar. The Premier Inn Edinburgh City Centre (Haymarket) is a short walk from Edinburgh Castle. Rosslyn Chapel can be reached via a local bus service. The Edinburgh International Conference Centre (EICC) is only 300 metres away. Some rooms can take 2 adults and up to 2 children (under 16 years). The 2 children also get a free full breakfast when accompanied by an adult eating a full breakfast. The full all-you-can-eat breakfast has the expected cooked items, including vegetarian sausages, as well as a wide continental selection. This hotel is located next to Ocean Terminal, Edinburgh's newest leisure and shopping destination, the Scottish Executive, the Royal Yacht Britannia and close to all major business areas. The old port area of Edinburgh, Leith, has many atmospheric bars, bistros and boutiques and is only 1.5 miles (2.4 km) from the city centre. Express By Holiday Inn Edinburgh Waterfront has good parking and a frequent public bus service from the front door, making it an ideal location for visiting all of the city's famous attractions such as Edinburgh Castle, Holyrood Palace, the Royal Mile, Princes Street, the national museums and galleries. 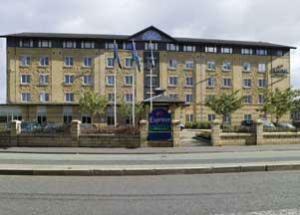 A warm Scottish welcome awaits you at the Best Western Edinburgh Capital Hotel. It is west of the city centre, yet only minutes from Edinburgh International Airport. It is convenient for Haymarket Station and the main visitor and historical attractions of Edinburgh. The refreshing, modern and airy interior is complemented by award-winning, friendly staff; comfortable and spacious bedrooms; and an extensive leisure club. A stay at the Best Western Edinburgh Capital is sure to make your visit to Edinburgh a memorable one. The Ibis Edinburgh has a superb location, right in the centre of the city, just a matter of metres from the Royal Mile and Princes Street, and less than 500 metres from Edinburgh Waverley Railway Station. In the heart of the city, the Ibis Edinburgh is just a short walk from all that Edinburgh has to offer. The shops, bars, cafes and restaurants of Princes Street are within easy walking distance. The hotel has 99 clean, comfortable en suite rooms available at great-value rates and there are 6 rooms suitable for disabled guests, wheelchair users and those with reduced mobility. The bar serves snacks 24 hours a day. Wi-Fi is available at an additional cost in the hotel's public areas and in some of the rooms. There is public parking available just 10 minutes' walk from the hotel, with special discounted rates for guests. 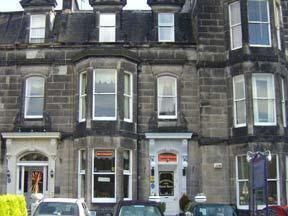 Over-Seas House has a city-centre location in the heart of Princes Street, Edinburgh's main shopping street. Enjoy excellent views of Edinburgh Castle and the city from most bedrooms and public rooms. All bedrooms are en suite, and have free Wi-Fi access and flat-screen TVs with digital channels. The second floor of the clubhouse has a bar, a restaurant and 3 function rooms. The apartments at Bonsyde are a new-build development of cottages in the grounds of the Bonsyde Hotel. Each apartment can accommodate up to 4 people in one double and one twin bedroom. The rooms are elegantly furnished in a contemporary style, and enjoy a 4-star rating from the tourist board. The Bonsyde House Hotel is in Linlithgow near Edinburgh, and just 15 minutes from Edinburgh International Airport. 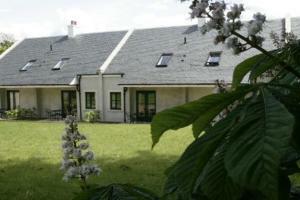 The apartments are self-catering, though the hotel provides breakfasts, lunches and evening meals. Bonsyde is ideally situated for visiting Edinburgh, Glasgow, Stirling, St Andrews and the Southern Highlands. Guards Hotel has a fantastic location opposite Haymarket Railway Station in West End and within 10 minutes' walk of Princes Street. The family-run hotel presents a wonderfully warm and welcoming atmosphere in the centre of the city. There are excellent bus links into the city centre and to Edinburgh Airport. This Premier Inn hotel is next door to Bannatyne's Health Club and Newcraighall Station, with direct trains to Edinburgh every 30 minutes. Buses to Edinburgh also pass the hotel. With free parking, the Premier Inn Edinburgh (Newcraighall) is in the Fort Kinnaird Retail Park. There are comfortable en suite rooms and a cosy Chef & Brewer restaurant, with open fires and a traditional-style menu. Some rooms can take 2 adults and up to 2 children (under 16 years). The 2 children also get a free full breakfast when accompanied by an adult eating a full breakfast. The full all-you-can-eat breakfast has the expected cooked items, including vegetarian sausages, as well as a wide continental selection. Luxury 19th Century setting with 21st Century facilities in Edinburgh, Scotland. The International Guest House is a luxury accommodation at an affordable price. The International has earned the unofficial title of Edinburgh's premier guest house, with its delicate blend of warm Scottish hospitality, Victorian elegance and modern comfort. The decor is outstanding, with original ornate plasterwork. The House is the ideal base for those either touring or on business. 'In Britain' magazine has rated The International as their 'find' in all Edinburgh. Situated in the heart of Edinburgh, the hotel occupies the perfect spot from which to explore the history of the Medieval Old Town and the architectural interest of the Georgian New Town. Nestled in the shadow of historical Edinburgh Castle, the Sheraton Grand Hotel and Spa is just a short walk away from the financial district - The Exchange - and the city's famous shopping thoroughfare, Princes Street. For your relaxation, the hotel is home to One, Europe's most advanced City Spa. The perfect place to indulge your mind, body, and spirit in luxurious 5-star opulence, the spa boasts a range of treatments and facilities. 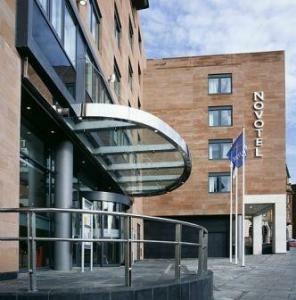 Close to lively Grassmarket and Edinburgh Castle, the central, modern Novotel Edinburgh Centre is a great city base with plenty of facilities. Princes Street shops and the Royal Mile are a 10-minute walk away. Arthur's Seat is a 15-minute walk and you can reach Edinburgh International Airport in a 15-minute drive. To relax, try the hotel's indoor pool, sauna, steam room, gym and whirlpool. Elements restaurant and bar has an international menu and friendly service. Each room is spacious, modern, quiet and clean, and 24-hour room service is available. Up to 2 children (under 16 years) can stay free (with breakfast) when sharing a room with adults. This includes access to video games, baby equipment and a healthy children's menu. Families also get late check-out on Sundays (until 17:00). With sea views, free parking nearby bus links to Edinburgh city centre, the Premier Inn (Leith) is close to Ocean Terminal and the Royal Yacht Britannia. The Premier Inn Leith has comfortable en suite rooms and a family-friendly Brewers Fayre restaurant, serving pub-style meals. Some rooms can take 2 adults and up to 2 children (under 16 years). The 2 children also get a free full breakfast when accompanied by an adult eating a full breakfast. The full all-you-can-eat breakfast has the expected cooked items, including vegetarian sausages, as well as a wide continental selection. At the east end of Princes Street, this historic hotel offers urban glamour and modern comfort. The castle, Scott Monument, Holyrood Palace and shopping districts are close by. Apex Waterloo Place Hotel is close to Waverley Train Station and there is a direct bus service to and from Edinburgh Airport, which is just one minutes walk from the hotel at Waverley Bridge. The stylish, spacious bedrooms are comfy and elegant, with soft neutral colours and good business facilities. There is a 42-inch LCD TV, air conditioning, free Wi-Fi internet access and 24-hour room service. Elliot's Bar and Restaurant, with its original fireplaces and Georgian windows, provides an elegant setting to enjoy modern Scottish cuisine. The hotel has stylish Yu Spa facilities, including a swimming pool, gym, sauna and steam room. There are 5 versatile function rooms.